The NAIBA fall conference is a week away -- and lucky you, it's not too late to register. Stephanie Anderson (Bookavore) and I recently sent a joint open letter to NYC bookstores about the value of the conference -- it's reproduced below. Hope to see you in Baltimore! 1) Attending the fall regional booksellers conference hosted by NAIBA (New Atlantic Independent Booksellers Association) has been incredibly good for our professional development and for our bookstores. 2) Very few New York City bookstores ever send booksellers to the NAIBA conference. Why this contradiction? We speculated about the possible reasons that New York City bookstore owners have not been attending the regional conference or sending their employees, and thought about some answers. The result is an expression of what we've found worthwhile about the NAIBA conference, and a modest proposal to NYC stores to consider sending a bookseller to the conference this year. This is an understandable reaction, especially in this economic climate. But as we all know, it takes money to make money. And more importantly, the education offered at the NAIBA conference can literally add money to your bottom line. For example, the session on "Capturing Coop" (Sunday, 3:45) alone could make your store enough money in a year to cover the cost of transportation, hotel, and conference registration for one bookseller or more, depending on your store. The " Online Right Now" lounge (Sunday and Monday), where experienced booksellers offer free one-on-one help with blogs, Twitter, Facebook and other forms of social media, could grow your customer base exponentially. The Pick of the Lists sessions (throughout the conference) could give you the tools to handsell dozens of books that might otherwise languish on your shelves. You could save the $100 registration fee (which admits up to 8 booksellers) by not going. But that would mean you're accepting the much greater loss of the potential profits the NAIBA educations sessions can create for your store. "I already know this stuff." Send your staff instead! If you've been in the business for 5 or 10 or 20 years, you might feel like you have nothing new to learn. But chances are you have younger booksellers working in your store who would benefit hugely from participating in this forum for professional development and community. Both of us (Stephanie and Jessica) found that our first NAIBA conference literally changed our lives: we went from being retail employees to feeling like members of a professional community, and our subsequent involvement in our stores and in our industry was the result. If we want our bookstores to prosper for years to come, it's worth investing in our frontline staff – the Emerging Leaders of our industry. You might find you have an incredibly talented and motivated bookseller right under your nose. "I can't take the time away from the store." The NAIBA conference is two days of being able to think about your store overall: the Big Picture. It's a time to talk to your colleagues and realize that your problems are similar and that you can share solutions. It's a chance to step away from the daily sales and profit margin, and think about where your store is and where it's going. It can be hard to justify carving out time from your daily routine. But it may be the only way to keep your store from stagnating. Without time to look at your bookstore from a different perspective, you risk making the same unconscious mistakes over and over again. "Going to the conference is a luxury, for successful stores with lots of time and money." Actually, the stores that attend NAIBA regularly tend to be prosperous bookstores because they invest the time and money in education and development. The conference rejuvenates them, gives them ideas, and makes them better bookstores. Your store can be one of those prosperous stores too. "NAIBA isn't for me – my New York store has nothing in common with bookstores in small towns and suburbs." This is perhaps the most entrenched reason for not attending the NAIBA conference – and there are so many reasons why it's counter-productive! First, the education offered at the conference is universally applicable: urban stores as well as rural ones need to understand co-op, create community, learn about books from graphic novels to children's books, and use technology to reach their customers. And when you begin to talk with your colleagues from upstate New York, Pennsylvania, Washington, D.C., New Jersey, and Maryland, you will probably find that you have even more in common with them than you do with the other retail stores on your city block. Independent booksellers are colleagues, no matter where their stores are located, and always have something to offer each other – New York City stores do themselves a disservice when they refuse to take advantage of that community. Feel like the mix of titles and authors at the conference doesn't reflect what sells in your store? Well, not attending the conference is a little bit like not voting in an election – you can't then complain that you're not represented. NAIBA has the potential to be a powerful force with publishers, attracting major talent and funding and making indie bookstores' voices heard – but not until a higher percentage of bookstores in the region attend and participate. So not only does the NAIBA conference offer a huge number of benefits to New York City stores, your participation has the potential to make it even better. We'll both be there this fall – we hope to see you there too! The NAIBA Fall Conference will be held October 3 to 5 in Baltimore, MD. Okay, so it's officially been over a month since I last posted here: my first and longest-running blog. I suspect anyone who's ever read The Written Nerd knows the reason why: my efforts have been shifted almost entirely over to the Greenlight Bookstore blog, and all the attendant activities and responsibilities of getting the bookstore off the ground. I thought maybe I'd have more time for blogging now that I don't have a "day job" -- but it turns out there's not a lot of down time in entrepreneurship. I haven't yet succumbed to the dreaded "bookstore owners have no time to read" syndrome (just finished A.S. Byatt's The Children's Book, now working on Zadie Smith's Changing My Mind and China Mieville's The City And The City) -- but it does seem to be the case that bookstore owners have no time for personal blogging. For a little while I thought about officially retiring this blog. In a way, it's served it's purpose: I needed a way to work out my thoughts about books, bookselling as a business, the community of booksellers and publishers, etc. Now I'm on the verge of achieving the goal I confessed to in my very first post, back in 2005: owning my own store. This blog has played a surprisingly big part in all of that. Someone asked me recently "do you do all your own publicity?" The answer is that I don't do publicity; I just talk about the store all the time in all kinds of forums, and The Written Nerd was the first. It introduced me to the folks at NAIBA, who asked me to join the board and brought me into a circle of smart and dedicated booksellers; it brought me to the attention of publishers who mailed me books for review and now are enthusiastically supporting Greenlight; it somehow gave me the status of "expert" on social media, author events and graphic novels, and I've gotten the opportunity to speak on panels about those topics and meet all kinds of new smart people. I haven't done a lot of chasing down reporters to get them to write about Greenlight Bookstore; the coverage we've gotten has come about in large part from the previous connections and visibility that's happened through The Written Nerd, and for that I'm surprised and grateful. I was the same kind of child as Miller: longing for a quest, a great battle or a cause to give my all for. This blog, and the last five years of my life, have been about discovering that I've done the hardest part: I've found the cause. Now I'm dealing (mostly) cheerfully with the trackless forests, snowy wastes, monsters, and menacing adults, on the grand and Quixotic adventure of opening a bookstore. But despite the fact that this blog has done great and noble service and could justifiably deserve an honorable retirement, I'm not going to shut it down just yet. It's nice to have a place to talk about books and stories that's not Greenlight -- that's just, still, my own. I noticed I have half a dozen posts in draft form that could go up any time, and I've got half a dozen more ideas for posts. I can't promise you'll see those here any time soon -- we're really in the final countdown to opening now and I think life is going to get more busy, not less. But I just wanted to check in, to reflect on what this blog has done and meant to me, and to let you know that it's not done yet. I've still got some more nerdy, overenthusiastic things to say for which this is still the best forum. Really, the adventure is just beginning. I don' t often use this blog to plug stuff going on at McNally Jackson, but sometimes it's just too good. Thanks to the diligent efforts of mixmaster Steve and blogmaster Dustin (who, incidentally, will be ably taking over my job as McJ events coordinator as I move on to Greenlight), the McNally Jackson blog is now a talkie. It's our inaugural event podcast! We've been sound recording author events for months now, hoping to preserve some of the great live conversations for posterity. At last, we've edited and hosted one of the best -- the star-studded March 30 poetry event with Robert Pinsky, Sharon Olds, Mark Strand, and Philip Schultz. Click over to the McNally Jackson blog -- if only to see the awesome picture of Dustin attempting to stuff a book into his ear. The audio sounds great -- all those resonant poet voices! Leave lots of comments so we know you're listening, and we'll feel all motivated to do some more. But this was the best BEA I've ever attended. I was lucky, in a way, that it was in New York this year, which made it easy for me to attend on my own dime as the new owner of Greenlight Bookstore... but that did mean I had to work some shifts at my day job at McNally Jackson so that other booksellers could make the show. So keep in mind that there's a lot of stuff that I missed. On Wednesday I was lucky to attend my last Emerging Leaders Council meeting. The national council representing frontline booksellers under 40 has finally gotten a rep from each of the 9 bookselling regions, and there's a lot of talent there. Perhaps we toot our own horn, but we like to think that some of the education the ABA offered this year was partly at our instigation (and there were EL booksellers on a large percentage of the panels), and that the increasing presence and visibility of young frontline booksellers at Winter Institute and regional shows can be traced back partially to our efforts as well. We met with folks from Unbridled Press and Ingram Book Distributors, both of whom are interested in supporting our work of mentoring and networking for younger frontline booksellers. This not only creates the professional booksellers of the future (I know my first sponsored visit to the NAIBA regional show is probably what made me choose this as my career), but it gives publishers the opportunity to put their books in front of the kids who actually hand books to customers on the sales floor. That night I was lucky to attend the Emerging Leaders Party, sponsored again by Book Expo itself, at the behest of the wonderful, inimitable BEA events director (and former indie bookseller) Lance Fensterman -- who was instrumental, obviously, in everything that made this show great. There were 250 RSVPs, both publishers and booksellers, and Last Exit Bar was packed. Dennis Johnson, the publisher of Brooklyn indie Melville House, attended along with his author, and wrote to me afterward "Who sez the book biz is dead? It was really energizing, so my thanks to you." Being a room full of young career booksellers has a way of making the future seem possible. I know galleys were missed at the rest of the show, but we had no shortage of book giveaways to accompany the featured authors. That list read like a who's who of up and coming talent: Margot Berwin (Pantheon), Ben Greenman (Melville House), Phil Gelatt & Rick Lacy (Oni Press), Hillary Jordan (Algonquin), Maaza Mengiste (W. W. Norton), and Peter Terzian (HarperCollins). When I got up to say thanks to the assembled youngsters, I told them about my new bookstore plans (the luckiest break of them all), and emphasized how much this network had been instrumental in making that happen: teaching me, supporting me, providing resources. I'm glad to move on to the next (emerged?) part of my career (and happy to hand my Council badge over to Stephanie Anderson), but it's been great to help to foster the future of bookselling, and great to know there are lots more book nerds still coming up through the ranks. I was lucky on Thursday to attend a couple of fantastic panels at the ABA Day of Education, one on book clubs and one on "the bookstore as a third place." I was speaking on the latter, but I took way more notes than I offered information. The ABA education staff seems to have mastered both curation and crowd sourcing: both panels had smart speakers up front to establish some best practices and set the tone, and then tapped into the collective wisdom in the room as booksellers offered their own good ideas and answered each others' questions. I came away with a notebook full of ideas to implement in Greenlight Bookstore and renewed respect, as always, for my bookselling colleagues. As an ABA staffer and I discussed in the booksellers' lounge later, indie booksellers are used to operating on a shoestring and turning on a dime -- some of us are struggling, but there's no end to the creativity and resourcefulness of these business people, and in some ways it's our moment to shine. Consumers understand the value of shopping local more than ever, and indie booksellers have lots of resources at our disposal to offer them the best bookstore experience possible. On Friday, Saturday, and Sunday, I considered myself lucky that this year, when it was really important for my partner Rebecca and I to focus on business and not get distracted by partying, that this was a show where partying had been scaled back, and everyone was serious about the business. We talked to point of sale vendors, wholesale distributors, and lots of publishers, getting the information and contacts we'll need to open our store in the fall. We have a lot of work ahead of us, and the timing couldn't have been better: right now is exactly when we needed to see all of these vendors to get the ball rolling. Speaking of timing, we are lucky that the American Booksellers Association has made such great strides with their e-commerce platform, and that it looks like it will be in shape to sell e-books by the time Rebecca and I open Greenlight Bookstore in the fall. We sat down with Ricky of the ABA to have him walk us through the website platform (Rebecca also attended a couple of the e-content panels as well and came away impressed), and felt like we were in good hands and we have good options. While many are throwing up their hands about online sales and electronic books, the ABA is working overtime to make sure indie booksellers have the tools they need to make e-commerce of print books and downloadable e-books another part of our revenue stream. As Rebecca and I agreed, we're not paper sellers, we're booksellers, and we're glad for the opportunity we will have to sell books in many forms and many places. I was incredibly lucky to be walking the floor all three days with a fantastic business partner, with whom I see so eye-to-eye that we can almost finish each other's sentences at this point (except when she's teaching me something new). "Do you think...?" "Yeah, totally," seemed to be the refrain as Rebecca and I navigated the riches of the publishing world. And as we got to introduce each other to all of the people we respectively know, the refrain became, "I've heard so much about you!" How lucky to work in a business of such cameraderie and enthusiasm, and with someone who has the same passion for books and readers, as well as good instincts about nearly everything. I seriously couldn't have handled this show -- or the entire bookstore startup process -- without Rebecca. I felt almost guiltily lucky every time I had my badge scanned to come into the exclusive-to-booksellers ABA lounge. We may be the lowest-paid segment of the industry, but we booksellers had free coffee, lemonade, snacks, internet access, and comfy couches to retreat to whenever we needed. And whenever I stopped in I was sure to run into a colleague I knew and loved, and especially my core group of bookfriends: Amanda, Steve, Kelly, Stephanie, Christine, Dustin, Sarah, Toby, Emily, Sweet Pea, Jenn, among others. These are people who are passionate about what they do, creative and energetic beyond belief, and awfully fun to be around. I have a sense that they're the ones I'll still be talking to in twenty years, through all the changes of our industry and our careers. Maybe we'll look back on this BEA as one of the last good ones, or as a quiet moment before things got big again, or as the beginning of a long-term change for the better. All I know now is that it was a hell of a show. If you haven't read Gerard Way and Gabriel Ba's trippy, funny dysfunctional superhero family graphic novel The Umbrella Academy: Apocalypse Suite, it's highly recommended. Dude, I have the action figures. If you like your mysteries with a bit of meta, but still insist on being richly entertained, you are so in luck -- this is the book for you. Rain-slicked streets and wood-paneled halls, sinister carnivals and decaying mansions, trench coats and fedoras and femmes fatales -- the iconography of the genre makes up the dreamlike landscape of this tightly structured and chaotically effulgent novel. Yet it's also a moving story of a humble Everyman trying to make his way in an incomprehensible system of institutions and obligations, and filled with both pathos and humor. My tagline: Chandler meets Kafka for whiskey-laced tea at G.K. Chesterton's house. I'm one of two booksellers at my store who LOVE this book to the point of obsession. And now I'm starting to see fedoras and pin-curls, mysterious briefcases and memorable umbrellas on my rainy commute to work. It's one of those books whose dreamlife seems to seep into real life, rendering the whole world more wonderfully mysterious. I thought this anthology might be a little fluffy for my tastes -- but after hearing some of the contributors read, I was open-mouthed in admiration and recognition, and totally hooked. (Some of my smartest girlfriends were equally intrigued --we're now reading it in anticipation of a drink-fueled book club discussion at some point.) As "traditionally" the non-wage earning gender, bearing the weight of all those Jane Austen marry-for-money-AND-love expectations even as we now have the power to make our own living, women have an especially fraught relationship with money. And that relationship affects our other relationships: with our parents, our friends, our romantic partners (especially those), and eventually our kids. The women writing here are married and single, come from wealth or poverty, have found financial success or still struggle to make ends meet -- and the questions they have to answer sound very familiar to me and my generation of women. What's necessity and what's luxury, and who decides? What's worth doing for money? What's the cost -- monetary and emotional -- of giving and receiving generosity? Who is rich and how do you know? What is financial equality -- both partners paying half, or both paying according to what they earn? The questions and experiences are intense, and I recognized myself, my friends, my enemies, and every relationship in my life in these stories. It's not often that a non-fiction book absorbs me like good fiction, but this one kept me rapt through every single essay, and gave me both new insights and new questions. Can't wait to discuss it with my girlfriends (and maybe even with my mom, my business partner, and my husband.) Compelling reading and definitely worth recommending, especially for women struggling anew with these questions in an uncertain economy. 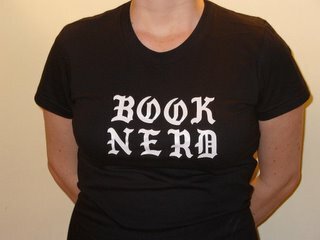 How many blogs can one bookseller blog? But after all this blithe blogging, it's time to address some real issues. There's been a lot of news about pirates these days, from the Somali coast to the music downloaders of Sweden to the DRM fears of publishers. (Would this make Amazon the British Navy, then?... but never mind.) It's all fun and games, as long as you're not the one being keelhauled. Luckily, (former) newswoman Tina Fey brings our attention to an aspect of this issue that should be taken very, very seriously: book pirates. This may actually replace The Pirates Who Don't Do Anything as my favorite pirate song ever. Thanks to Bookavore for the tip via Twitter, and have a beautiful Friday! I feel that way this week listening to the conversation about e-readers and ARCreaders, let by my bookselling colleagues/buddies Stephanie Anderson (WORD, Brooklyn) and Jenn Northington (King's English, Salt Lake City). Both are fellow Emerging Leaders types, and they're leading the charge in embracing the possibilities and pushing the boundaries and fostering the conversation. That conversation has been going on for a while on Twitter. Jenn made a modest proposal on her blog a couple of weeks ago. And Stephanie brought it together with today's column in Shelf Awareness. The question is, generally: would it make sense for booksellers to read ARCs on e-readers? And who's gonna get them for us? I haven't jumped in before now because 1) I've been preoccupied and 2) I wanted to get the lay of the land. I still have a bit of catching up to do on this conversation (I just signed up for netGalley, finally, today), but I'm ready to venture a tentative opinion or two. I want to talk a little about ebooks and e-readers in general, and why it makes sense for booksellers to start reading ebooks. The question of how and from whom we'll get those expensive ereaders is one that will have to be hashed out at length in many forums, so I'm not going there quite yet. To me, one of the most important things for booksellers (and readers and publishers) to realize now is that e-reader DOES NOT EQUAL Kindle. A bit that stuck out for me in Stephanie's column: "A side benefit to such a program could be to increase interest on the part of customers in e-readers that aren't the Kindle--booksellers have already noticed some of their best customers are switching some reading to the Kindle because it's the reader that's most familiar to them right now." I think for a lot of booksellers right now, the idea of an e-reader provokes growls of hostility because it's associated with the Kindle, which is a proprietary platform sold and administered by Amazon, our primary competitor. We indies can't sell ebooks for the Kindle, so if readers buy a Kindle in means, on some level, lost sales for us. But the Kindle is not the only e-reader, nor even necessarily the best! The Sony Reader, the iPhone, the Google phone, and other electronic devices can also be used to read ebooks -- and those platforms are wide open for ebook sales from indie bookstores, provided our ecommerce technology is up to par. Just as we have to educate our customers (and ourselves) that Amazon is not the only option for buying online, we'll have to make some efforts to make sure those who want to read ebooks know that they have options besides the Kindle, and that they can still "read indie while reading e" (feel free to steal that tagline). And ebook-reading booksellers are the perfect group to start spreading that word, to make sure that we can make ebooks a part of our business model rather than just more competition. Here's the next most important issue: E-readers make sense for people who read in massive quantities. Many of our sales reps are already reading on Sony readers, and it makes sense for booksellers too. We'll all most likely still be reading plenty of pbooks (that's print, or "real" books), but since it's in our job description to read widely and quickly, carrying around many on one device makes sense. Our best customers probably buy books from us, from other indies, from chain stores, online, and borrow from the library too. We hope to have them buy the majority from us, but we know the biggest readers are getting books from many different places. Chances are, some of them are going to start reading ebooks as a part of their book addiction. This pretty obviously doesn't mean they're going to stop buying print books. But it does mean we have a chance to sell them something additional. If we start familiarizing ourselves with the products, the formats, etc., we'll be better handsellers of ebooks. And isn't that what we do? One thing that also seems clear to me, and that will be important as this conversation goes on: we need a standard format for ebooks. At this point there are a number of different file types for ebooks floating around, and they don't all work on all devices. If publishers can agree on a standard file format (like .mp3s for music), that will go a long way toward making ebooks more accessible, and toward enabling indies, among other channels, to sell them effectively. The Association of American Publishers supports the .epub format, and it would be great if this could get codified pretty soon. Okay, in all seriousness, I've seen some of the various platforms for ereaders on the iPhone, and it's pretty exciting -- I'd love to spend more time with it. Along with some of my other smart buddies, I can see the iPhone (and other multi-use devices) becoming the primary method of reading ebooks in future. It kind of reminds me of the "orison" in the central chapter of David Mitchell's Cloud Atlas -- a communicator, a recorder and player of print and visual information, a mapping device, etc. -- technology so advanced it feels like magic. It doesn't feel anti-literature; it feels like a very literary vision of the future. As you can probably tell, I'm still pretty new to this conversation, and I've got a lot to learn. I get a lot of mynews and opinions on ebook stuff on the Teleread blog, which I recommend. And you can follow the conversation of those smart kids on Twitter by searching #ereader, #digiARCs, or #ARCreader. I'm delighted to get to hobnob with these smarties, and excited about where the conversation will go. Update: I must also mention (and link) the other smart booksellers whose ebook musings I've been reading lately: Rich Rennicks (Malaprops), Arsen Kashkashian (Boulder Bookstore), and Patrick (Vroman's), among others.